I asked my friend Danakil Horst, a Qabalah expert in England, to guest blog about the Qabalistic view of survival after death. What he wrote has many surprising and interesting parallels with other spiritual traditions. What I find most amazing about it is how closely it follows my own experience as a psychic and medium with the greater reality I see of the human spirit. Thank you Danakil! For more on the Qabalah look at Danakil’s website: www. sapengro. com. In antiquity it was customary for each ‘teller of tales’ to add their own personal touches to the cultural stock of written stories, yet the Torah (Hebrew scripture) carried explicit instructions that it should always be copied without the slightest alteration. Later Jewish students of Torah noticed that the text had obvious fundamental errors in grammar and spelling, as well as contradictions. They deduced that these flaws were deliberate and meaningful. Torah scholars began decoding the text to produce what eventually became known as Qabalah (also Kabbalah), a mystical interpretation of the universe that has fascinated people from many religious and cultural backgrounds ever since. 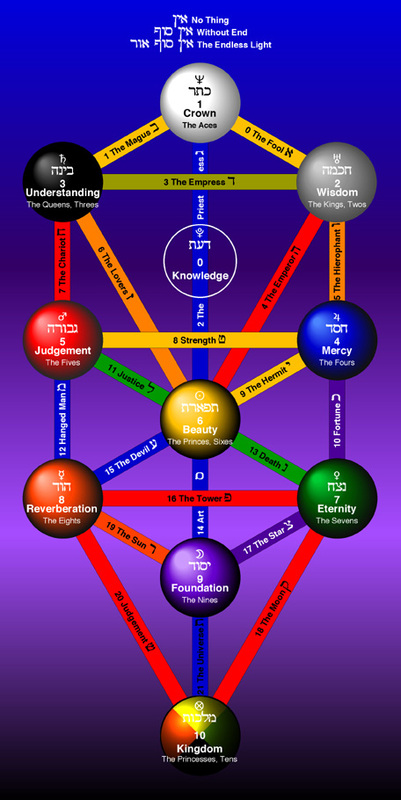 The studies of the letter sequence, particularly in ‘Genesis,’ led to the construction of a diagram, the Tree of Life, which consists of 10 Spheres (the Sephiroth) connected by 22 Paths (the letters of the Hebrew alphabet). With this key, more complex passages could be decoded to reveal information, not just religious and spiritual, but also scientific, psychological and philosophical. The uncovered codes of the Genesis text work like a mathematical equation (for example, x = a2 + 2ab + b2). The equation or key can be applied to other stories by correlating letter sequences, in much the same way mathematical equations are correlated by inserting different values. The result you get is predicated upon the values you enter. Using this code can have dramatic consequences. Hidden information comes to light. For example, four centuries before Newton published his experiments on light passing through a prism, the Zohar (one of the primary texts) said, “White is the color which contains all colors.” This was not discovered by experiment, but by decoding the letter sequence in Genesis. In the centuries since, the Tree of Life has shown itself to model discoveries in Mathematics (Catastrophe Theory, Dissipative Structures), Cosmology (Big Bang, String Theory), Brain Function (Executive Function Theory), Information Theory and many other branches of science. Even more, it is used to support personal growth and spiritual enlightenment by people of all religions. I know a follower of the Jain faith who told me his guru uses the Tree to illuminate their scriptures. The Tree replicates itself repeatedly, and every creative system has the Tree as its ground plan. One of the areas that the text illuminates concerns the nature of human identity, revealed as a hierarchy of Souls. Qabalists speak of between 3 and 5 “souls.” As some of these souls can be regarded as aspects of one soul, I will describe just three. The Nephesch guides the form of a body from conception on. It is the directive force behind the mysterious process whereby one cell becomes muscle, another a brain cell, and so forth, as the embryo grows into a fetus. The Nephesch is mortal and fades away within days of physical death. The highest soul, the formless Neschamah, is closely united to the Divine. It is here that our true identity resides and Life is found. It operates beyond the everyday human characteristics of thought and feeling, although its nature filters down our personal Tree of Life to maintain the more familiar aspects of our identity. The Neschamah is immortal. At some point it dissolves back into the Divine from whence it came. Between the Nephesch and the Neschamah is the Ruach, which enters (or forms in) our bodies at, or soon before, the quickening. It is the matrix for our mind in the same way that the Nephesch is for our bodies. It also works as the interface between the two other souls. The hierarchy of souls portrays the true nature of our existence. “Mind” and “body” are just the ways that our limited abilities visualize the Ruach and Nephesch. We perceive only what our senses permit. The soul is not really in the body, for example. The image of our manifest form is in the soul. It is the way the Ruach (mind) perceives the Nephesch (body). The traditional Qabalistic view of what happens after mortal death is Metempsychosis; the Ruach moves to another life attached to a new Nephesch; an idea strikingly similar to reincarnation. However, there is no notion of karma nor one that being human is the highest achievement. A life as a cactus might be just what a developing soul needs! The Ruach brings the essence of its identity into a new life when it reincarnates for the next step in its development. Before reincarnation or even instead of it, it may (temporarily or permanently) reside in a “heaven.” Eastern religions have the concept of a “Bodhisattva,” someone who refuses the last steps in enlightenment in order to facilitate the growth of others, which loosely corresponds to the Christian concept of saints and to the work of the disembodied Ruach. After separation from the Nephesch, the Ruach continues to fulfill its destiny. It also continues to communicate with the living until family reconciliation or other unfinished business has been concluded to its satisfaction. Your Nephesch will die. Your Ruach, however, will continue to live in some form or another. It will continue to develop, to receive and pass on accumulated wisdom and to reincarnate when appropriate with a new Nephesch. The final stages of existence will be lived as the Neschamah. Eventually your growth will be complete and your destiny fulfilled. It is then that you as the Neschamah will return to the One.